Researchers attempt to learn more about diseases like Alzheimer’s and Parkinson’s by focusing on protein filaments that form fibrous clusters called amyloids in the brain. Until now, the best tools for studying them have generated limited views, largely because the strands are complex and tiny, just a few nanometers thick. Now, an international research team has come up with a new method to potentially reveal the structure of individual amyloid fibrils with powerful beams of X-ray laser light. In experiments conducted at the Linac Coherent Light Source (LCLS) at the Department of Energy’s SLAC National Accelerator Laboratory, the scientists placed up to 50 fibrils at a time on a layer of graphene and hit them with bursts of X-ray laser light. The graphene, it turned out, was almost transparent to the X-rays, and this allowed them to probe the structures of the delicate fibrils without picking up significant extraneous signals from the graphene layer in individual snapshots. While the team did not uncover the complete fibril structure, they said the innovative method opens up a promising path for amyloid studies using X-ray free-electron lasers, or XFELs, such as LCLS. Accurate information about the structure of amyloid fibrils can inform scientists about their role in the development of neurodegenerative diseases. Earlier attempts to study fibrils at X-ray lasers delivered them into the path of the beam in jets of fluid. Switching to a solid graphene carrier gave the team two advantages; Since graphene is just one layer of atoms thick, it leaves hardly a trace in the diffraction patterns formed by X-rays scattering off the fibrils, which are used to determine their structures, the researchers said. And the regular structure of the graphene encourages the fibrils to all line up in the same direction. This allows diffraction patterns to be obtained from fewer than 50 amyloid fibrils. Based on the results, the team hopes to eventually get patterns from single fibrils. 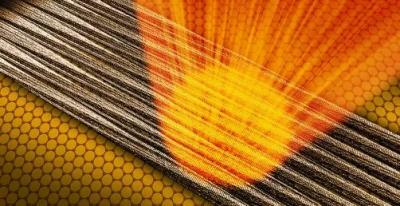 To get to that goal, new methods of exposing a single fibril to the XFEL beam will need to be developed.